Chemotherapy is normally associated with debilitating side effects due to systemic toxicity to normal cells, however targeting the chemotherapeutics directly to the tumour should dramatically reduce these side effects. Several technologies designed to accomplish this are under development (Table 1). Researchers of the NTU-Northwestern Institute of Nanomedicine at Nanyang Technological University in Singapore are developing magnetic microbubbles which can contain chemotherapeutics. The microbubbles can be systemically delivered and imaged in real time. The chemotherapeutic is released from the microbubbles at the tumour site by directing ultrasound at the location . Therefore this technology has the potential to specifically deliver any chemotherapeutic to a desired tumour site in the body. Researchers at PanTher Therapeutics are developing a novel drug-eluting device for targeting chemotherapeutics to solid tumours. The cremaphor formulation of paclitaxel has dose limiting toxicity which prevent its use for pancreatic cancer. Paclitaxel’s toxicity like the majority of chemotherapeutics stems from its systemic delivery and toxicity to normal cells. However recently an albumin-bound formulation (nab-paclitaxel) has demonstrated increased survival times in combination with gemcitabine compared to gemcitabine alone . And now PanTher Therapeutics’ novel biodegradable device has been developed which can deliver chemotherapeutics including paclitaxel directly to the pancreas limiting systemic toxicities . Researchers at PharmaCyte Biotech, Inc. are developing a cell encapsidation technology called Cell-in-a-Box® which protects the cells inside from the host immune system while allowing the free exchange of soluble proteins and chemicals. The chemotherapeutic ifosfamide is activated in the liver by cytochrome P450 enzymes and must travel systemically to the tumour site. The greater the distance of the tumour from the liver the greater the dose requirement for effective delivery. The toxicities induced by an effective dose for pancreatic cancer are too great. Using Cell-in-a-Box®, activated ifosfamide can however be targeted to the pancreatic cancer reducing the dose requirement. Cell-in-a-Box® is made of polymers of cellulose sulphate . Clinical studies have shown that it is possible to encapsulate 293 cells overexpressing cytochrome P450 and deliver the capsules to the pancreas via the blood vessels without adverse effects. Lower doses of ifosfamide can then be systemically delivered and yet have a high active local concentration at the pancreas. A phase II trial is planned to confirm effectiveness in pancreatic cancer patients refractory to gemcitabine and abraxane or FOLFIRINOX . Researchers of the University of North Carolina at Chapel Hill have developed a new device based on inserting positive and negative electrodes on either side of a tumour, injecting a chemotherapeutic and then applying an electric field in order to drive the therapeutic into the tumour. This Iontophoresis device has been tested in pancreatic cancer mouse xenograft models with gemcitabine and the newer combination FOLFIRINOX. Significant tumour volume reductions compared to intravenous delivery of the chemotherapeutic were found in both cases [6, 7]. Clinical trials are planned in the near future . Gao, Yu, Chon U Chan, Qiushi Gu, Xudong Lin, Wencong Zhang, David Chen Loong Yeo, Astrid Marlies Alsema, et al. ‘Controlled Nanoparticle Release from Stable Magnetic Microbubble Oscillations’. NPG Asia Materials 8, no. 4 (8 April 2016): e260. doi:10.1038/am.2016.37. Byrne, J. D., M. N. R. Jajja, A. T. O’Neill, L. R. Bickford, A. W. Keeler, N. Hyder, K. Wagner, et al. ‘Local Iontophoretic Administration of Cytotoxic Therapies to Solid Tumors’. Science Translational Medicine 7, no. 273 (4 February 2015): 273ra14–273ra14. doi:10.1126/scitranslmed.3009951. Byrne, James D., Mohammad R. N. Jajja, Allison N. Schorzman, Amanda W. Keeler, J. Christopher Luft, William C. Zamboni, Joseph M. DeSimone, and Jen Jen Yeh. ‘Iontophoretic Device Delivery for the Localized Treatment of Pancreatic Ductal Adenocarcinoma’. Proceedings of the National Academy of Sciences 113, no. 8 (23 February 2016): 2200–2205. doi:10.1073/pnas.1600421113. ‘Early-Stage Drug Delivery Implant Targeting Pancreatic Cancer Tumors Showing Promise – FierceDrugDelivery’. Accessed 7 March 2016. http://www.fiercedrugdelivery.com/story/early-stage-drug-delivery-implant-targeting-pancreatic-cancer-tumors-showin/2016-02-16. Lipid-based drug delivery (LBDD) systems have gained much importance in the recent years due to their ability to improve the solubility and bioavailability of drugs with poor water solubility9. The absorption of drug from lipid based formulation depends on numerous factors, including particle size, degree of emulsification, rate of dispersion and precipitation of drug upon dispersion4 and 10. This paper provides an overview of steps being taken by BIND Biosciences Inc. to translate innovative research conducted at the Massachusetts Institute of Technology (MIT) and Harvard Medical School into novel, targeted, polymeric nanotherapeutics. Schematic diagram of a BIND targeted polymeric nanoparticle. BIND Biosciences Inc. (BIND), a biopharmaceutical company that was founded upon the research of two pioneers in nanoparticle drug delivery, Professor Robert Langer of MIT and Professor Omid Farokhzad of Brigham and Women’s Hospital of the Harvard Medical School, has developed methods of engineering targeted nanoparticles composed of biodegradable and biocompatible polymers with precise biophysicochemical properties optimized to deliver drugs for specific therapeutic applications (Gu et al., 2008). The foundational research by Langer and Farokhzad put BIND in a position to pursue the development of targeted polymeric nanotherapeutics for treating several diseases. BIND’s lead program is focused on translating their innovative academic findings into improved treatments for patients with cancer. The BIND technology offers a unique combination of long-circulating nanoparticles with the capability of targeting diseased cells specifically and releasing drugs from nanoparticles in a programmable, controlled way. Figure 1 is a schematic diagram of a BIND targeted nanoparticle. The targeting ligand enables the nano-particle to recognize specific proteins or receptors on the surface of cells involved in disease, or in the surrounding extracellular matrix, and bind, with high specificity and avidity, to its intended cellular target site. Many types of cancer have been shown to have cell-surface receptors that are highly expressed on the cancer cells (e.g., prostate cancer [prostate-specific membrane antigen, PSMA], breast cancer [human epidermal growth factor receptor 2, HER-2], and lung cancer [epidermal growth factor receptor, EGFR]), and many drugs are being evaluated that might improve treatment outcomes. Surface functionalization imparted by a PEG component shields the targeted nanoparticles from MPS immune clearance, while providing an attachment site for the targeting ligand on the particle surface at precise, controlled levels through proprietary linkage strategies. A key to the successful development of BIND targeted nanoparticles is the optimization of the nanoparticle surface, which requires a precise balance between the targeting ligand and PEG coverage so the nanoparticle surface is masked enough to provide circulation times long enough to reach the disease site and enough targeting ligand on the surface to effectively bind to the target cell surface receptors. This delicate balance requires precise control over the nanoparticle production process. It also requires the discovery and selection of ligands that are potent and specific enough to bind selectively to the targeted disease cells while remaining bound to the nanoparticle surface. The polymer matrix, the bulk of the nanoparticle composition, encapsulates the drug in a matrix of clinically safe, validated biodegradable and biocompatible polymers that can be designed to provide appropriate particle size, drug-loading level, drug-release profile, and other critical properties. A variety of drugs or therapeutic payloads can be incorporated into the targeted nanoparticles, including small molecules, peptides, proteins, and nucleic acids, such as siRNA. A composite magnetic nanoparticle drug delivery system provides targeted controlled release chemotherapies for cancerous tumors and inflammatory diseases. The magnetic nanoparticle includes a biocompatible and biodegradable polymer, a magnetic nanoparticle, the biological targeting agent human serum albumin, and a therapeutic pharmaceutical composition. The composite nanoparticles are prepared by oil-in-oil emulsion/solvent evaporation and high shear mixing. An externally applied magnetic field draws the magnetic nanoparticles to affected areas. The biological targeting agent draws the nanoparticles into the affected tissues. Polymer degradation provides controlled time release delivery of the pharmaceutical agent. Nanoparticle delivery systems for cancer therapy: advances in clinical and preclinical research. Egusquiaguirre SP1, Igartua M, Hernández RM, Pedraz JL. Clin Transl Oncol. 2012 Feb;14(2):83-93. http://dx.doi.org:/10.1007/s12094-012-0766-6. Nanoparticle drug delivery systems exploit the abnormal characteristics of tumour tissues to selectively target their payloads to cancer cells, either by passive, active or triggered targeting. Int J Nanomedicine. 2008 Jun; 3(2): 133–149. The use of nanotechnology in medicine and more specifically drug delivery is set to spread rapidly. Currently many substances are under investigation for drug delivery and more specifically for cancer therapy. Interestingly pharmaceutical sciences are using nanoparticles to reduce toxicity and side effects of drugs and up to recently did not realize that carrier systems themselves may impose risks to the patient. The kind of hazards that are introduced by using nanoparticles for drug delivery are beyond that posed by conventional hazards imposed by chemicals in classical delivery matrices. For nanoparticles the knowledge on particle toxicity as obtained in inhalation toxicity shows the way how to investigate the potential hazards of nanoparticles. The toxicology of particulate matter differs from toxicology of substances as the composing chemical(s) may or may not be soluble in biological matrices, thus influencing greatly the potential exposure of various internal organs. This may vary from a rather high local exposure in the lungs and a low or neglectable exposure for other organ systems after inhalation. However, absorbed species may also influence the potential toxicity of the inhaled particles. For nanoparticles the situation is different as their size opens the potential for crossing the various biological barriers within the body. From a positive viewpoint, especially the potential to cross the blood brain barrier may open new ways for drug delivery into the brain. In addition, the nanosize also allows for access into the cell and various cellular compartments including the nucleus. A multitude of substances are currently under investigation for the preparation of nanoparticles for drug delivery, varying from biological substances like albumin, gelatine and phospholipids for liposomes, and more substances of a chemical nature like various polymers and solid metal containing nanoparticles. It is obvious that the potential interaction with tissues and cells, and the potential toxicity, greatly depends on the actual composition of the nanoparticle formulation. This paper provides an overview on some of the currently used systems for drug delivery. Besides the potential beneficial use also attention is drawn to the questions how we should proceed with the safety evaluation of the nanoparticle formulations for drug delivery. For such testing the lessons learned from particle toxicity as applied in inhalation toxicology may be of use. Although for pharmaceutical use the current requirements seem to be adequate to detect most of the adverse effects of nanoparticle formulations, it can not be expected that all aspects of nanoparticle toxicology will be detected. So, probably additional more specific testing would be needed. Recent years have witnessed unprecedented growth of research and applications in the area of nanoscience and nanotechnology. There is increasing optimism that nanotechnology, as applied to medicine, will bring significant advances in the diagnosis and treatment of disease. Anticipated applications in medicine include drug delivery, both in vitro and in vivo diagnostics, nutraceuticals and production of improved biocompatible materials (Duncan 2003; De Jong et al 2005; ESF 2005; European Technology Platform on Nanomedicine 2005; Ferrari 2005). Engineered nanoparticles are an important tool to realize a number of these applications. It has to be recognized that not all particles used for medical purposes comply to the recently proposed and now generally accepted definition of a size ≤100 nm (The Royal Society and Royal Academy of Engineering 2004). However, this does not necessarily has an impact on their functionality in medical applications. The reason why these nanoparticles (NPs) are attractive for medical purposes is based on their important and unique features, such as their surface to mass ratio that is much larger than that of other particles, their quantum properties and their ability to adsorb and carry other compounds. NPs have a relatively large (functional) surface which is able to bind, adsorb and carry other compounds such as drugs, probes and proteins. However, many challenges must be overcome if the application of nanotechnology is to realize the anticipated improved understanding of the patho-physiological basis of disease, bring more sophisticated diagnostic opportunities, and yield improved therapies. Although the definition identifies nanoparticles as having dimensions below 0.1 μm or 100 nm, especially in the area of drug delivery relatively large (size >100 nm) nanoparticles may be needed for loading a sufficient amount of drug onto the particles. In addition, for drug delivery not only engineered particles may be used as carrier, but also the drug itself may be formulated at a nanoscale, and then function as its own “carrier” (Cascone et al 2002; Baran et al 2002; Duncan 2003; Kipp 2004). The composition of the engineered nanoparticles may vary. Source materials may be of biological origin like phospholipids, lipids, lactic acid, dextran, chitosan, or have more “chemical” characteristics like various polymers, carbon, silica, and metals. The interaction with cells for some of the biological components like phospholipids will be quite different compared to the non biological components such as metals like iron or cadmium. Especially in the area of engineered nanoparticles of polymer origin there is a vast area of possibilities for the chemical composition. Although solid NPs may be used for drug targeting, when reaching the intended diseased site in the body the drug carried needs to be released. So, for drug delivery biodegradable nanoparticle formulations are needed as it is the intention to transport and release the drug in order to be effective. However, model studies to the behavior of nanoparticles have largely been conducted with non-degradable particles. Most data concerning the biological behavior and toxicity of particles comes from studies on inhaled nanoparticles as part of the unintended release of ultrafine or nanoparticles by combustion derived processes such as diesel exhaust particles (reviewed by Oberdörster 1996; Donaldson et al 2001, 2004; Borm 2002;Donaldson and Stone 2003; Dreher 2004; Kreyling et al 2004; Oberdörster, Oberdörster et al 2005). Research has demonstrated that exposure to these combustion derived ultrafine particles/nanoparticles is associated with a wide variety of effects (Donaldson et al 2005) including pulmonary inflammation, immune adjuvant effects (Granum and Lovik 2002) and systemic effects including blood coagulation and cardiovascular effects (Borm and Kreyling 2004;Oberdorster, Oberdörster et al 2005). Since the cut-off size for both ultrafine and nanoparticles (100 nm) is the same, now both terms are used as equivalent. Based on the adverse effects of ultrafine particles as part of environmental pollution, engineered nanoparticles may be suspected of having similar adverse effects. It is the purpose of this review to use this database on combustion derived nanpoarticles (CDNP) obtained by inhalation toxicology and epidemiology and bridge the gap to engineered nanoparticles. Faster development of new safe medicines. The main issues in the search for appropriate carriers as drug delivery systems pertain to the following topics that are basic prerequisites for design of new materials. They comprise knowledge on (i) drug incorporation and release, (ii) formulation stability and shelf life (iii) biocompatibility, (iv) biodistribution and targeting and (v) functionality. In addition, when used solely as carrier the possible adverse effects of residual material after the drug delivery should be considered as well. In this respect biodegradable nanoparticles with a limited life span as long as therapeutically needed would be optimal. Table 1 presents some of the types of chemical structures and possibilities for the preparation of nanoscale materials used as pharmaceutical carrier system (reviewed in Borm and Muller-Schulte 2006). Certainly none of the so far developed carriers fulfill all the parameters mentioned above to the full extent; the progress made in nanotechnology inter alia emerging from the progress in the polymer-chemistry, however, can provide an intriguing basis to tackle this issue in a promising way. Cancer drugs are injected into the bloodstream and move through the body seeking out fast-growing cancer cells. One consequence of chemotherapy is the unintended effect on different parts of the body, including messing up the digestive system. Such side effects can be minimized if the drug is better targeted. Another consequence of the poor targeting of some chemo drugs is that they miss cancer cells entirely. For these reasons, different research groups are focusing on drug delivery: finding smart ways to direct the anti-cancer drug to the required target. One such research team is led by Professor Warren Chan of the University of Texas. Professor Chan thinks the answer to more effective targeting is the use of nanoparticles. In trials, the research group has used nanoparticles attached to strands of DNA that can, remarkably, change shape to gain improved access to cancerous tissue. The complication with the approach is based on different cancers. Because different types of cancer differ in morphology, and cancers at different stages equally vary, selecting the appropriate nanoparticle is important. Here the research group have been looking at nanoparticles of varying sizes and shapes, as well as different coatings. The solution is to create nanoparticles that can change shape to meet different types of tumors. This structural alteration makes the technology more versatile and means treatments could be delivered more quickly, rather than waiting for test results to assess the size and shape of the tumor. The shape-shifting has been achieved by constructing the nanoparticles from tiny fragments of metal and then attaching DNA to them. The DNA acts as a means for marking the cancer, and then allowing the chemotherapy drug to attack the tumor. Proc Nat Acad Sci Feb 16, 2016; http://dx.doi.org:/10.1073/pnas.1521265113www.pnas.org/lookup/suppl/doi:10.1073/pnas.1521265113/-/DCSupplemental. Nanotechnology is a promising approach for improving cancer diagnosis and treatment with reduced side effects. A key question that has emerged is: What is the ideal nanoparticle size, shape, or surface chemistry for targeting tumors? Here, we show that tumor pathophysiology and volume can significantly impact nanoparticle targeting. This finding presents a paradigm shift in nanomedicine away from identifying and using a universal nanoparticle design for cancer detection and treatment. Rather, our results suggest that future clinicians will be capable of tailoring nanoparticle designs according to the patient’s tumor characteristics. This concept of “personalized nanomedicine” was tested for detection of prostate tumors and was successfully demonstrated to improve nanoparticle targeting by over 50%. Nanoparticles can provide significant improvements in the diagnosis and treatment of cancer. How nanoparticle size, shape, and surface chemistry can affect their accumulation, retention, and penetration in tumors remains heavily investigated, because such findings provide guiding principles for engineering optimal nanosystems for tumor targeting. Currently, the experimental focus has been on particle design and not the biological system. Here, we varied tumor volume to determine whether cancer pathophysiology can influence tumor accumulation and penetration of different sized nanoparticles. Monte Carlo simulations were also used to model the process of nanoparticle accumulation. We discovered that changes in pathophysiology associated with tumor volume can selectively change tumor uptake of nanoparticles of varying size. We further determine that nanoparticle retention within tumors depends on the frequency of interaction of particles with the perivascular extracellular matrix for smaller nanoparticles, whereas transport of larger nanomaterials is dominated by Brownian motion. These results reveal that nanoparticles can potentially be personalized according to a patient’s disease state to achieve optimal diagnostic and therapeutic outcomes. Mechanisms for targeted delivery of nanoparticles in cancer. With the evolution of the “omics” era, our molecular understanding of cancer has exponentially increased, leading to the development of the concept of personalized medicine. Nanoparticle technology has emerged as a way to combine cancer specific targeting with multifunctionality, such as imaging and therapy, leading to advantages over conventional small molecule based approaches. In this review, we discuss the targeting mechanisms of nanoparticles, which can be passive or active. The latter utilizes small molecules, aptamers, peptides, and antibodies as targeting moieties incorporated into the nanoparticle surface to deliver personalized therapy to patients. Nanotechnology could be defined as the technology that has allowed for the control, manipulation, study, and manufacture of structures and devices in the “nanometer” size range. These nano-sized objects, e.g., “nanoparticles”, take on novel properties and functions that differ markedly from those seen from items made of identical materials. The small size, customized surface, improved solubility, and multi-functionality of nanoparticles will continue to open many doors and create new biomedical applications. Indeed, the novel properties of nanoparticles offer the ability to interact with complex cellular functions in new ways. This rapidly growing field requires crossdisciplinary research and provides opportunities to design and develop multifunctional devices that can target, diagnose, and treat devastating diseases such as cancer. This article presents an overview of nanotechnology for the biologist and discusses the attributes of our novel XPclad© nanoparticle formulation that has shown efficacy in treating solid tumors, for single dose vaccination, and oral delivery of therapeutic proteins. The development of a wide spectrum of nanoscale technologies is beginning to change the scientific landscape in terms of disease diagnosis, treatment, and prevention. These technological innovations, referred to as nanomedicines by the National Institutes of Health, have the potential to turn molecular discoveries arising from genomics and proteomics into widespread benefit for patients. Nanoparticles can mimic or alter biological processes (e.g., infection, tissue engineering, de novo synthesis, etc.). These devices include, but are not limited to, functionalized carbon nanotubes, nanomachines (e.g., constructed from interchangeable DNA parts and DNA scaffolds), nanofibers, self-assembling polymeric nanoconstructs, nanomembranes, and nano-sized silicon chips for drug, protein, nucleic acid, or peptide delivery and release, and biosensors and laboratory diagnostics. Drug delivery in cancer is important for optimizing the effect of drugs and reducing toxic side effects. Several nanotechnologies, mostly based on nanoparticles, can facilitate drug delivery to tumors. Hydrogel-nanoparticles are based on proprietary technology that uses hydrophobic polysaccharides for encapsulation and delivery of drug, therapeutic protein, or vaccine antigen. A novel system using cholesterol pullulan shows great promise. In this regard, four cholesterol molecules gather to form a self-aggregating hydrophobic core with pullulan outside. The resulting cholesterol nanoparticles stabilize entrapped proteins by forming this hybrid complex. These particles stimulate the immune system and are readily taken up by dendritic cells. Alternatively, larger hydrogels can encapsulate and release monoclonal antibodies. Curcumin, a substance found in the cooking spice turmeric, has long been known to have anti-cancer properties. Nevertheless, widespread clinical application of this relatively efficacious agent has been limited due to its poor solubility and minimal systemic bioavailability. This problem has been resolved by encapsulating curcumin in a polymeric nanoparticle, creating “nanocurcumin” (Bisht et al., 2007). Further, the mechanism of action of nanocurcumin on pancreatic cancer cells mirrors that of free curcumin, including induction of apoptosis, blockade of nuclear factor kappa B (NFκB) activation, and downregulation of pro-inflammatory cytokines (i.e., IL-6, IL-8 and TNF-α). Nanocurcumin provides an opportunity to expand the clinical repertoire of this efficacious agent by enabling soluble dispersion. Future studies utilizing nanocurcumin are warranted in preclinical in vivo models of cancer and other diseases that might benefit from the effects of curcumin. Block-copolymer micelles are spherical super-molecular assemblies of amphiphilic copolymer. The core of micelles can accommodate hydrophobic drugs, and the shell is a hydrophilic brush-like corona that makes the micelle water soluble, thereby allowing delivery of the poorly soluble contents. Camptothecin (CPT) is a topoisomerase I inhibitor that is effective against cancer, but clinical application of CPT is limited by its poor solubility, instability, and toxicity. Biocompatible, targeted sterically stabilized micelles (SSM) have been used as nanocarriers for CPT (CPT-SSM). CPT solubilization in SSM is expensive yet reproducible and is attributed to avoidance of drug aggregate formation. Furthermore, SSM composed of PEGylated phospholipids are attractive nanocarriers for CPT delivery because of their size (14 nm) and ability to extravasate through the leaky microvasculature of tumors and inflamed tissues. This passive targeting results in high drug concentration in tumors and reduced drug toxicity to the normal tissues (Koo et al., 2006). Stealth micelle formulations have stabilizing PEG coronas to minimize opsonization of the micelles and maximize serum half-life. Currently, SP1049C, NK911, and Genexol-PM have been approved for clinical use (Sutton et al., 2007). SP1049C is formulated as doxorubicin (DOX)-encapsulated pluronic micelles. NK911 is DOX-encapsulated micelles from a copolymer of PEG-DOX-conjugated poly(aspartic acid), and Genexol-PM is a paclitaxelencapsulated PEG-PLA micelle formulation. Polymer micelles have several advantages over other drug delivery systems, including increased drug solubility, prolonged circulation halflife, selective accumulation at tumor sites, and lower toxicity. However, at the present time this technology lacks tumor specificity and the ability to control the release of the entrapped agents. Indeed, the focus of nano-therapy has gradually shifted from passive targeting systems (e.g., micelles) to active targeting. Super paramagnetic iron oxide particles can be used in conjunction with magnetic resonance imaging (MRI) to localize the tumor as well as for subsequent thermal ablation. This has been used, for example, to target glioblastoma multiforme (GBM), a primary malignant tumor of the brain with few effective therapeutic options. The primary difficulty in treating GBM lies in the difficulty of delivering drugs across the BBB. However, nanoscale liposomal iron oxide preparations were recently shown to improve passage across the BBB (Jain, 2007). Nanomaterials have been successfully manipulated to create a new drug-delivery system that can solve the problem of poor water solubility of most promising currently available anticancer drugs and, thereby, increase their effectiveness. The poorly soluble anticancer drugs require the addition of solvents in order for them to be easily absorbed into cancer cells. Unfortunately, these solvents not only dilute the potency of the drugs but create toxicity. Researchers from the University of California Los Angeles California Nanosystem Institute have devised a novel approach using silica-based nanoparticles to deliver the anticancer drug CPT and other water insoluble drugs to cancer cells (Lu et al., 2007). The method incorporates the hydrophobic anticancer drug CPT into the pores of fluorescent mesoporous silica nanoparticles and delivers the particles into a variety of human cancer cells to induce cell death. The results suggest that the mesoporous silica nanoparticles might be used as a vehicle to overcome the insolubility of many anticancer drugs. Novel nanosystems can be pre-programmed to alter their structure and properties during the drug delivery process, allowing for more effective extra- and intra-cellular delivery of encapsulated drug (Wagner, 2007). This is achieved by the incorporation of molecular sensors that respond to physical or biological stimuli, including changes in pH, redox potential, or enzymes. Tumor-targeting principles include systemic passive targeting and active receptor targeting. Physical forces (e.g., electric or magnetic fields, ultrasound, hyperthermia, or light) may contribute to focusing and triggering activation of nano systems. Biological drugs delivered with programmed nanosystems also include plasmid DNA, siRNA, and other therapeutic nucleic acids. Using a degradable, polyamine ester polymer, polybutanediol diacrylate co amino pentanol (C32), a diptheria toxin suicide gene (DT-A) driven by a prostate-specific promoter was directly injected into normal prostate and prostate tumors in mice (Peng et al., 2007). This C32/DT-A system resulted in significant size reduction, apoptosis in 50% of normal prostate. However, a single injection of C32/DT-A triggered apoptosis in 80% of tumor cells present in the tissue. It is expected that multiple nanoparticle injection would trigger a great percentage of prostate tumor cells to undergo apoptosis. These results suggest that local delivery of polymer/DT-A nanoparticles may have application in the treatment of benign prostatic hypertrophy and prostate cancer. Multidrug resistance (MDR) of tumor cells is known to develop through a variety of molecular mechanisms. Glucosylceramide synthase (GCS) is responsible for the activation of the pro-apoptotic mediator, ceramide, to a nonfunctional moiety, glucosylceramide. This molecule is over-expressed by many MDR tumor types and has been implicated in cell survival in the presence of chemotherapy. A study has investigated the therapeutic strategy of co-administering ceramide with paclitaxel in an attempt to restore apoptotic signaling and overcome MDR in a human ovarian cancer cell line using modified poly(epsiloncaprolactone) (PEO-PCL) nanoparticles to encapsulate and deliver the therapeutic agents for enhanced efficacy (van Vlerken and Amiji, 2006). Results show that MDR cancer cells can be completely eradicated by this approach. Using this approach, MDR cells can be resensitized to a dose of paclitaxel near the IC50 of non-MDR cells. Molecular analysis of activity verified the hypothesis that the efficacy of this therapeutic approach is due to a restoration in apoptotic signaling, showing the promising potential for clinical use of this therapeutic strategy to overcome MDR. Indiscriminate drug distribution and severe toxicity of systemic administration of chemotherapeutic agents can be overcome through encapsulation and cancer cell targeting of chemotherapeutics in 400 nm nanocells, which can be packaged with significant concentrations of chemotherapeutics of different charge, hydrophobicity, and solubility (MacDiarmid et al., 2007). Targeting of nanocells via bispecific antibodies to receptors on cancer cell membranes results in endocytosis, intracellular degradation, and drug release. Doses of drugs delivered via nanocells are ∼1,000 times less than the dose of the free drug required for equivalent tumor regression. It produces significant tumor growth inhibition and regression in mouse xenografts and lymphoma in dogs, despite administration of minute amounts of drug and antibody. Indeed, reduced dosage is a critical factor for limiting systemic toxicity. Clinical trials are planned for testing this method of drug delivery. In early studies, dendrimer-based drug delivery systems focused on encapsulating drugs. However, it was difficult to control the release of drugs associated with dendrimers. Recent developments in polymer and dendrimer chemistry have provided a new class of molecules called dendronized polymers, which are linear polymers that bear dendrons at each repeat unit. Their behavior differs from that of linear polymers and provides drug delivery advantages because of their enhanced circulation time. Another approach is to synthesize or conjugate the drug to the dendrimers so that incorporating a degradable link can be further used to control the release of the drug. DOX was conjugated to a biodegradable dendrimer with optimized blood circulation time through the careful design of size and molecular architecture (Lee et al., 2006). Specifically, the DOX-dendrimer controlled drug-loading through multiple attachment sites, solubility through PEGylation, and drug release through the use of pH-sensitive hydrazone dendrimer linkages. In culture, DOX-dendrimers were >10 times less toxic than free DOX toward colon carcinoma cells. Upon intravenous administration to tumor bearing mice, tumor uptake of DOX-dendrimers were nine-fold higher than intravenous free DOX and caused complete tumor regression and 100% survival of the mice after 60 days. Nanotubes Even though it was previously possible to attach drug molecules directly to antibodies, attaching more than a handful of drug molecules to an antibody significantly limits its targeting ability because the chemical bonds that are used tend to impede antibody activity. A number of nanoparticles have been investigated to overcome this limitation. Tumor targeting single-walled carbon nano-tube (SWCNT) have been synthesized by covalently attaching multiple copies of tumor-specific monoclonal antibodies (MAbs), radiation ion chelates and fluorescent probes (McDevitt et al., 2007). A new class of anticancer compound was created that contains both tumor-targeting antibodies and nanoparticles called fullerenes (C60). This delivery system can be loaded with several molecules of an anticancer drug, e.g., Taxol® (Ashcroft et al., 2006). It is possible to load as many as 40 fullerenes onto a single skin cancer antibody called ZME-108, which can be used to deliver drugs directly into melanomas. Certain binding sites on the antibody are hydrophobic (water repelling) and attract the hydrophobic fullerenes in large numbers so multiple drugs can be loaded into a single antibody in a spontaneous manner. No covalent bonds are required, so the increased payload does not significantly change the targeting ability of the antibody. The real advantage of fullerene-based therapies vs. other targeted therapeutic agents is likely to be fullerene’s potential to carry multiple drug payloads, such as taxol plus other chemotherapeutic drugs. Cancer cells can become drug resistant, and one can cut down on the possibility of their escaping treatment by attacking them with more than one kind of drug at a time. The first fullerene immuno-conjugates have been prepared and characterized as an initial step toward the development of fullerene immunotherapy. Polymersomes, hollow shell nanoparticles, have unique properties that allow delivery of distinct drugs. Loading, delivery and cytosolic uptake of drug mixtures from degradable polymersomes were shown to exploit the thick membrane of these block copolymer vesicles, their aqueous lumen, and pH-triggered release within endolysosomes. Polymersomes break down in the acidic environments for targeted release of these drugs within tumor cell endosomes. While cell membranes and liposomes are created from a double layer of phospholipids, a polymersome is comprised of two layers of synthetic polymers. The individual polymers are considerably larger than individual phospholipids but have many of the same chemical features. Polymersomes have been used to encapsulate paclitaxel and DOX for passive delivery to tumor-bearing mice (Ahmed et al., 2006). The large polymers making up the polymersome allows paclitaxel, which is water insoluble, to embed within the shell. DOX is water-soluble and stays within the interior of the polymersome until it degrades. The polymersome and drug combination spontaneously self-assembles when mixed together. Recently, studies have shown that cocktails of paclitaxel and DOX lead to better tumor regression that either drug alone, but previously there was no carrier system that could carry both drugs as efficiently to a tumor. Hence, this approach shows great promise. Single-particle quantum dots conjugated to tumor-targeting anti-human epidermal growth factor receptor 2 (HER2) MAb have been used to locate tumors using high-speed confocal microscopy (Tada et al., 2007). Following injection of quantum dot-MAb conjugate, six distinct stop-and-go steps were identified in the process as the particles traveled from the injection site to the tumor where they bound HER2. These blood-borne conjugates extravasated into the tumor, bound HER2 on cell membranes, entered the tumor cells and migrated to the perinuclear region. The image analysis of the delivery processes of single particles in vivo provided valuable information on MAb-conjugated therapeutic particles, which will be useful in increasing their anticancer therapeutic efficacy. However, the therapeutic utility of quantum dots remains undetermined. The poor aqueous solubility of many drug candidates presents a significant problem in drug delivery and related requirements such as bioavailability and absorption. Recently, our laboratory has developed XPclad® nanoparticles that represent a novel formulation method that uses planetary ball milling to generate particles of uniform size (Figure 1), 100% loading efficiency of hydrophobic or hydrophilic drugs, subsequent coating for targeted delivery, and control of LogP for systemic, cutaneous, or oral administration of cancer drugs, vaccines, or therapeutic proteins (Figure 2). The method for making XPclad® nanoparticles uses a novel and relatively inexpensive preparation technique (i.e., planetary ball milling), which allows for controlling the size of the particles (100 nm to 50 μm; ± 10% of mean size) with >99% loading efficiency, polymer- or ligand-coating for controlled-, protected-, and targeted-release and delivery of their contents. The nanoparticles produced thereby contain the desired biologically active agent(s) in a biopolymer excipient such as alginate, cellulose, starch or collagen and biologically active agents. Generally, there are two types of mills that have been employed for making particles: vibratory or planetary ball mills. The vibratory ball milling grinds powders by high velocity impact while planetary ball milling employs a grinding motion. Typically, planetary ball milling has been used only to generate micron-sized particles, while vibratory milling can yield nano-particles. However, the high impact resulting from the vibratory milling technique makes incorporating biologicals difficult. Planetary ball mills pulverize and mix materials ranging from soft and medium to extremely hard, brittle and fibrous materials. Both wet and dry grinding can be carried out. Minerals, ores, alloys, chemicals, glass, ceramics, plant materials, soil samples, sewage sludge, household and industrial waste and many other substances can be reduced in size simply, quickly and without loss. Planetary ball mills have been successfully used in many industrial and research sectors, particularly wherever there is high demand for purity, speed, fineness and reproducibility. The planetary ball mills produce extremely high centrifugal forces with very high pulverization energies and short grinding times. Because of the extreme forces exerted, the use of vibratory and planetary ball mills to formulate therapeutics has not been practiced until now. In general, XPclad® particle size can be engineered to range from 5 to 30 nm up to 10 to 60 μm by controlling the size and number of planetary balls, grinding speed, milling cycles, and centrifugal force by varying the revolutions per second and planetary jar velocity. Nano delivery systems hold great potential to overcome some of the obstacles to efficiently target a number of diverse cell types. This represents an exciting possibility to overcome problems of drug resistance in target cells and to facilitate the movement of drugs across barriers (e.g., BBB). The challenge, however, remains the precise characterization of molecular targets and ensuring that these molecules only affect targeted organs. Furthermore, it is important to understand the fate of the drugs once delivered to the nucleus and other sensitive cells organelles. USC researchers have created an automated method of manufacturing nanoparticles that may transform the process from an expensive, painstaking, batch-by-batch process by a technician in a chemistry lab, mixing up a batch of chemicals by hand in traditional lab flasks and beakers. Consider, for example, gold nanoparticles. Their ability to slip through the cell’s membrane makes them ideal delivery devices for medications to healthy cells, or fatal doses of radiation to cancer cells. But the price of gold nanoparticles at $80,000 per gram, compared to about $50 for pure raw gold goes. The solution, published in an open access paper in Nature Communications on Feb. 23, is microfluidics — manipulating tiny droplets of fluid in narrow channels. The team 3D-printed tubes about 250 micrometers in diameter, possibly the smallest, fully enclosed 3D printed tubes anywhere. Then they built a parallel network of four of these tubes, side-by-side, and ran a combination of two non-mixing fluids (like oil and water) through them. As the two fluids fought to get out through the openings, they squeezed off tiny droplets. Each of these droplets acted as a microscale chemical reactor in which materials were mixed and nanoparticles were generated. Each microfluidic tube can create millions of identical droplets that perform the same reaction. This sort of exotic process has been envisioned in the past, but its hasn’t been able to be scaled up because the parallel structure meant that if one tube got jammed, it would cause a ripple effect of changing pressures along its neighbors, knocking out the entire system. The researchers bypassed this problem by altering the geometry of the tubes themselves, shaping the junction between the tubes such that the particles come out a uniform size and the system is immune to pressure changes. The translation of batch chemistries onto continuous flow platforms requires addressing the issues of consistent fluidic behaviour, channel fouling and high-throughput processing. 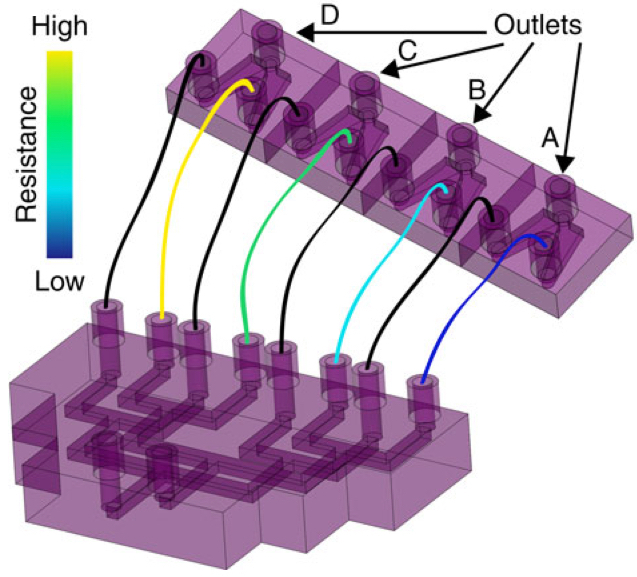 Droplet microfluidic technologies reduce channel fouling and provide an improved level of control over heat and mass transfer to control reaction kinetics. However, in conventional geometries, the droplet size is sensitive to changes in flow rates. Here we report a three-dimensional droplet generating device that exhibits flow invariant behaviour and is robust to fluctuations in flow rate. In addition, the droplet generator is capable of producing droplet volumes spanning four orders of magnitude. We apply this device in a parallel network to synthesize platinum nanoparticles using an ionic liquid solvent, demonstrate reproducible synthesis after recycling the ionic liquid, and double the reaction yield compared with an analogous batch synthesis. Cell culture is essential tool in drug discovery, tissue engineering and stem cell research. Conventional tissue culture produces a two dimensional cell growth with gene expression, signalling and morphology that can be different from those found in vivo. In some cases, cells may or may not adhere to the tissue culture dishes. Technology developed by n3D Biosciences brings cells together in a dish using magnetic nanoparticles to levitate them in a magnetic field. This procedure allows cells to develop into spheroids, but if they touch the bottom of the dish, they spread out in a single layer. The technology developed by n3D Biosciences provide an alternative to biodegradable porous scaffold and protein matrices. Conventionally, biodegradable scaffold may suffer from slow or delayed propagation of cells and establishment of cell-cell interactions. The technology allows adaptable magnetic-based cell levitation and can provide an improved three-dimensional cell growth condition in certain settings. To achieve this, the first step is to attach magnetic nanoparticles to the cell’s surface which is done by crosslinking the gold and iron oxide nanoparticles with polylysine. In the second step, the cells are brought together while levitating them off the dish. In this condition, the cells can develop in surroundings mirroring growth inside a body where the cells are in contact with each other. The media exchange is also relatively simple because a magnet holds the tissue in place. A research group in Australia has developed algae nanoparticles. The algae have been found to kill 90 percent of cancer cells in cultured human cells. Based on this success, the modified algae have been shown to destroy cancerous tumors in mice. Algae is a general term for a range of single-celled microscopic photosynthetic organisms such as diatoms, and larger, multi-cellular plants, like kelp. 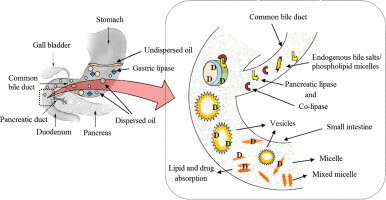 The use of algae in cancer treatment relates to drug delivery. Some success has been achieved with the use of nanoparticles (such as nanoporous silica) to deliver anti-cancer medicines. One downside with this relates to the cost of production and the fact that some nanoparticles can be toxic. To overcome this, researchers based at the University of South Australia have used algae to model an alternative drug delivery system. Success has been achieved with microalgae-derived nanoporous biosilica. The bio-material was derived from Thalassiosira pseudonana, which is a species of marine diatom. Diatoms are are among the most common types of phytoplankton, and they are found in the oceans, in freshwater, in soils and on damp surfaces. In studies, modified diatoms have been used as types of backpacks for the targeted delivery of anticancer drugs to tumor sites. Although the results are interesting, experiments in cell culture and even on mice do not necessarily translate into success in humans. A series of clinical trials will be required to verify the results and to streamline any potential treatment options. Bahman Delalat, Vonda C. Sheppard, Soraya Rasi Ghaemi, Shasha Rao, Clive A. Prestidge, Gordon McPhee, Mary-Louise Rogers, et al. The ability to selectively kill cancerous cell populations while leaving healthy cells unaffected is a key goal in anticancer therapeutics. The use of nanoporous silica-based materials as drug-delivery vehicles has recently proven successful, yet production of these materials requires costly and toxic chemicals. Here we use diatom microalgae-derived nanoporous biosilica to deliver chemotherapeutic drugs to cancer cells. The diatom Thalassiosira pseudonana is genetically engineered to display an IgG-binding domain of protein G on the biosilica surface, enabling attachment of cell-targeting antibodies. Neuroblastoma and B-lymphoma cells are selectively targeted and killed by biosilica displaying specific antibodies sorbed with drug-loaded nanoparticles. Treatment with the same biosilica leads to tumour growth regression in a subcutaneous mouse xenograft model of neuroblastoma. These data indicate that genetically engineered biosilica frustules may be used as versatile ‘backpacks’ for the targeted delivery of poorly water-soluble anticancer drugs to tumour sites. Figure 4: Interaction of anti-CD20 antibody-labelled GB1–biosilica with B and T cells captured on an anti-CD45 antibody microarray.